It was a familiar voice, a broadcasting institution no less, in the form of John Snagge that welcomed listeners to the latest of the first wave of home town radio stations, BBC Radio Stoke-on-Trent, as it launched on Wednesday 14 March 1968. Snagge's career at the BBC had started in Stoke some forty-odd years earlier when he'd been appointed as Assistant Director of the relay station, known by the call sign 6ST. His opening remarks gave a nod to history: “This is BBC Radio Stoke on Trent. We must apologise to listeners for the break in transmission which occurred at 12 o'clock midnight, on October 30th 1928. 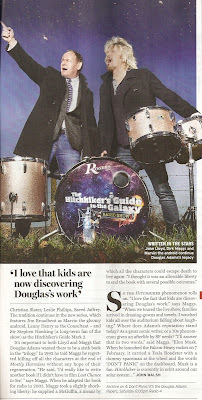 This was due to circumstances beyond our control. Normal transmission has now been resumed”. 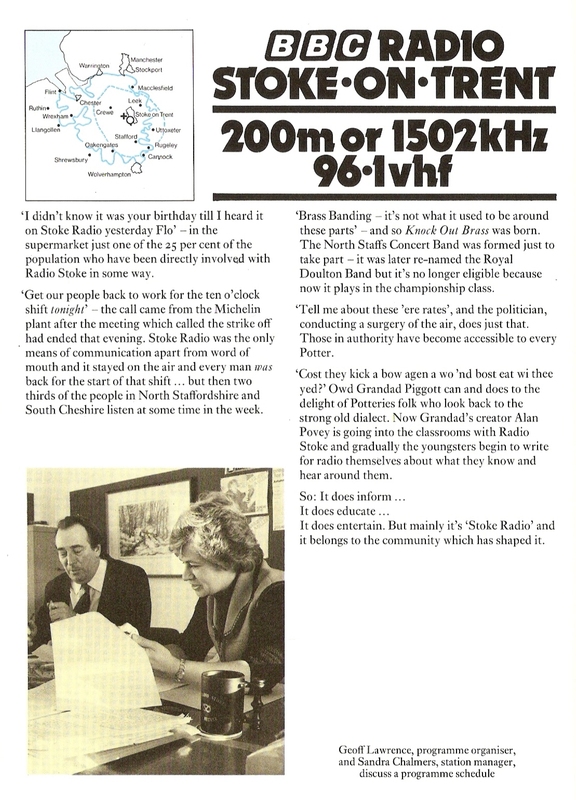 The local authority in Stoke was a keen advocate of the local radio experiments and had secured sufficient funding for the first two years. The area had been involved in the 1961 broadcasting trials proposed by Frank Gillard and recordings of the Stoke tests had been used in the submission to the Pilkington Committee. 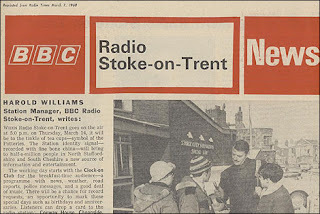 Supposedly BBC Radio Stoke-on-Trent (it was shortened to BBC Radio Stoke in the 1980s) was set to go on-air earlier but the outbreak on foot and mouth in 1967 had prevented engineers crossing fields to access the VHF mast at Alsagers Bank near Newcastle-under-Lyme. In the event the station launched using a low-powered VHF transmitter at Hanchurch Water Tower south of Stoke. "There followed an eclectic mix of programming: interviews with the Lord Mayor and John Snagge, the local news or as we called it the Home News, the pop show Take One and the evening news magazine Potteries Roundabout which I studio produced. I then did a couple of continuity announcements introducing a local choir and the business programme, Enterprise 68 before my first ever 30 minute feature 6 ST Calling (over which I had sweated blood) was broadcast. 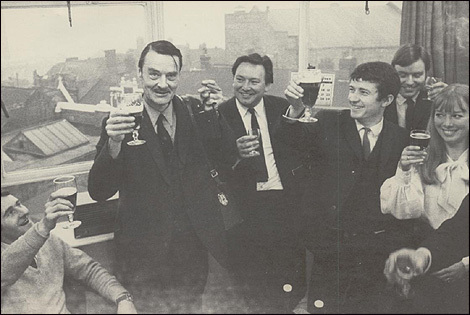 I then chaired a gentle discussion with John Snagge reminiscing about the station with old friends and colleagues." Owen Bentley had come to BBC local radio from the World Service and though initially appointed to work in Stoke he'd spent a few months at BBC Radio Sheffield due to the delay in launching . 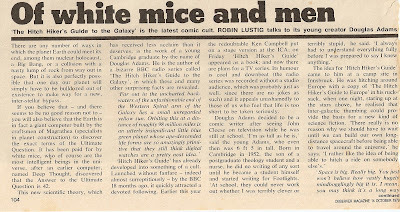 He moved to Radio Oxford when that launched in 1970, had a short stint in Botswana and then was back at Sheffield in 1974/75 as their Programme Organiser and then manager at Radio Leicester (1975-82) where he was instrumental in getting the Asian Network off the ground. In the 80s he was the head of Local Radio and Network Radio for the Midlands. Stoke's studios were in Conway House, Cheapside in Hanley (the current studios are now further down Cheapside). Among the small team assembled by Harold Williams was his second in command, Programme Organiser John Cordeaux. John had joined the BBC in 1945 and by the mid-50s was working as the Overseas Instructor in the BBC's Staff Training Department. After three years in Stoke he left to manage Radio Humberside. Williams himself would leave to become Assistant Head of Local Radio Development. 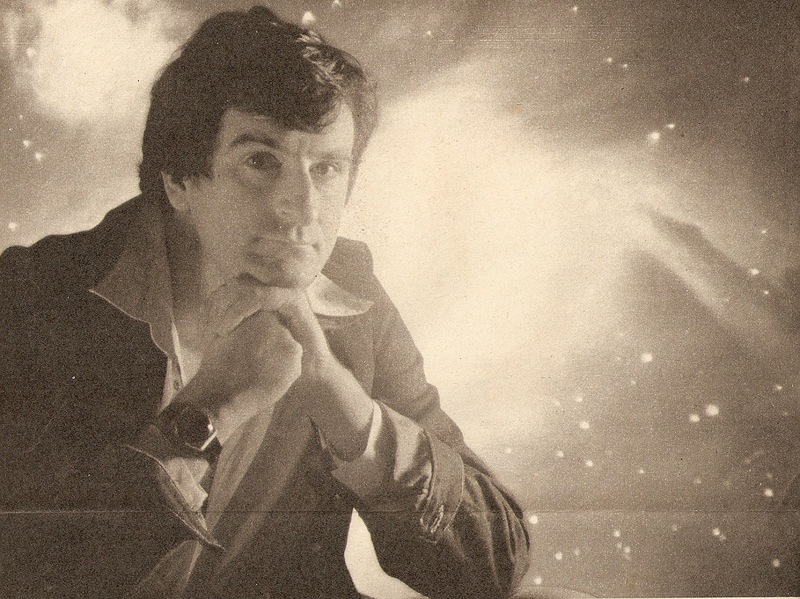 There short themes were composed for the station by David Cain of the BBC Radiophonic Workshop. 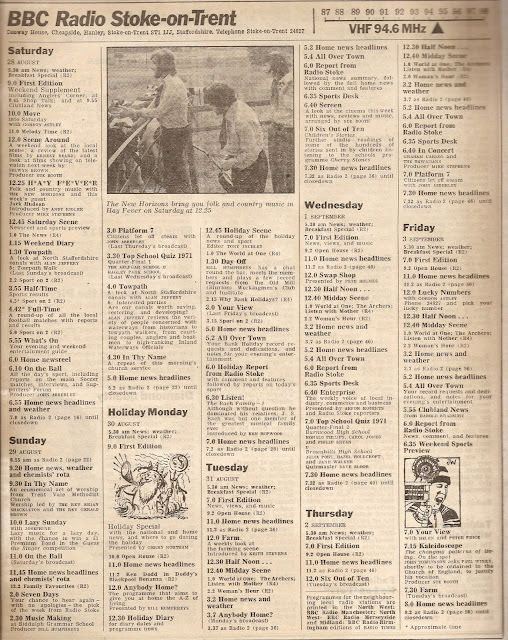 This is how the schedule looked just a month after going live with the Radio Times listings for the week commencing 13 April 1968. The weekday programmes, just four or five hours a day, are clustered around breakfast, lunch and teatimes; for the rest of the day they dipped into the network offerings from Radios 1, 2 and 4. On the Sunday, Easter Sunday in this case, you'll spot the church service In Thy Name. Uniquely across local radio the station was the only one that has broadcast a weekly service from the start and continues to do so, now known as In Praise of God. Some other names you'll have heard on air that year were David Gredington, later the first Programme Organiser at Radio Humberside, Ann Skellern, Tony Waters, Gerry Northam and John Abberley. Gerry left Stoke in the early 70s to work on BBC TV educational programmes and network radio before joining File on 4 in 1979 first as producer then editor and then for many years as the programme's main investigative reporter. Most recently he's been the picker on Pick of the Week. John Abberley was well-versed in the Potteries area having worked on the Evening Sentinel since 1949. He joined the station at launch as one of the production assistants where he would specialise in sports coverage, he presented the Saturday teatime round-up On the Ball, and news reporting, working with the station's first news editor Tony Inchley (later the manager at BBC WM) - though in common with most of the new local stations they initially used a news agency, in Stoke's case the local branch of Raymonds News Agency. After just over 20 years at the station Abbo rejoined the Sentinel. He died in 2010 aged 78. Moving on three years this is the Stoke schedule for week commencing 28 August 1971. 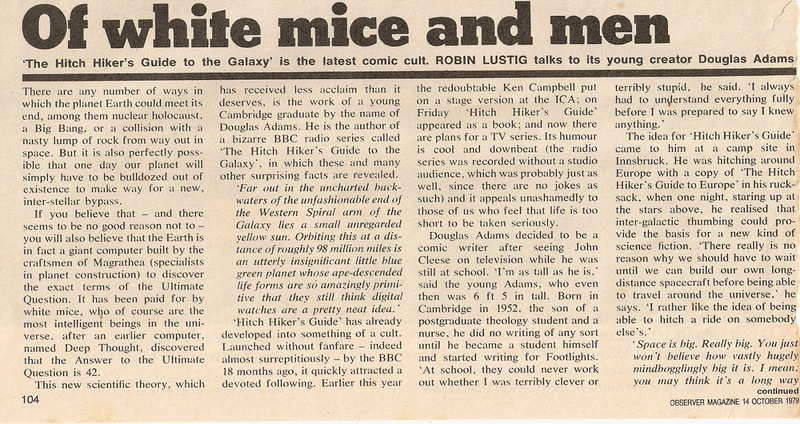 By this time the station manager was David Harding and Geoff Lawrence, a very experienced Light Programme and Radio 2 producer, had come in as the programme organiser; he would go on to be the station manager in the mid-80s, replacing Sandra Chalmers. Popping up on Saturday morning and Friday's Lucky Numbers is Gordon Astley, with possibly his first radio gig. This was well before his Cheggers Plays Pop and TISWAS days and radio work at Mercia Sound, BBC Southern Counties, BBC WM, BBC Radio Northampton and Century 106. Presenting Enterprise is renowned journalist Arfon Roberts. He was one of the station's first news producers who'd come to Stoke from BBC Wales were he'd been the first journalist on the scene when the Aberfan Disaster occurred. Other names here include long-time presenter and producer Bill Humphreys who worked with the 'Legendary Lonnie' and Andy Ridler who I've a vague recollection also did a stint at Humberside. But just who is 'Josephine' who presents Lazy Sunday? All this is a few years before one of radio's best known names started his career at the station. Local lad Bruno Brookes had appeared on the station on the Topics for Teenagers programme and eventually joined the staff hosting an afternoon show Bruno at Three between 1982 and 1984 before receiving a call from Doreen Davies to join Radio 1. BBC Radio Stoke is celebrating its 50th anniversary this week with a series of six specials, Who We Are, presented by Nick Hancock. 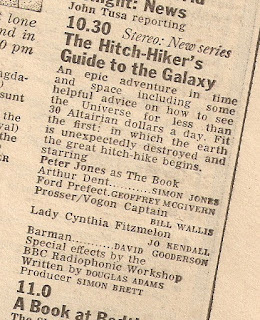 Exactly forty years ago today Radio 4 unleashed on an unsuspecting audience the first ever episode of that comedy adventure in space and time, The Hitch-Hiker's Guide to the Galaxy. 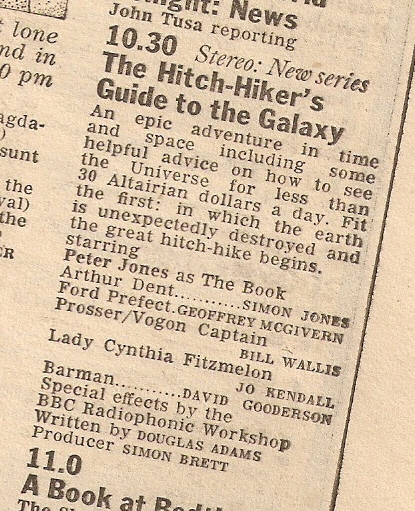 The Radio Times was of the opinion that "science-fiction fans with a sense of humour will welcome (the) six-part adventure story" but its wide appeal immediately became apparent and, in an unprecedented move, the BBC gave it a repeat just a fortnight after the last episode went out plus a third airing that November. Tonight Radio 4 starts a new series of what is termed the Hexagonal Phase. 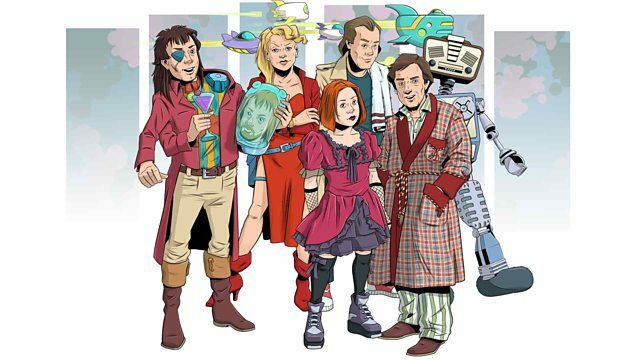 Based on some unpublished notes from Douglas Adams's archive and the follow-up novel And Another Thing... by Eoin Colfer it re-unites some of the original cast: Simon Jones, Geoffrey McGivern, Mark Wing-Davey and Sandra Dickinson plus other star names including Lenny Henry, Jim Broadbent, Jane Horrocks, Ed Byrne, Jon Culshaw and Stephen Hawking. 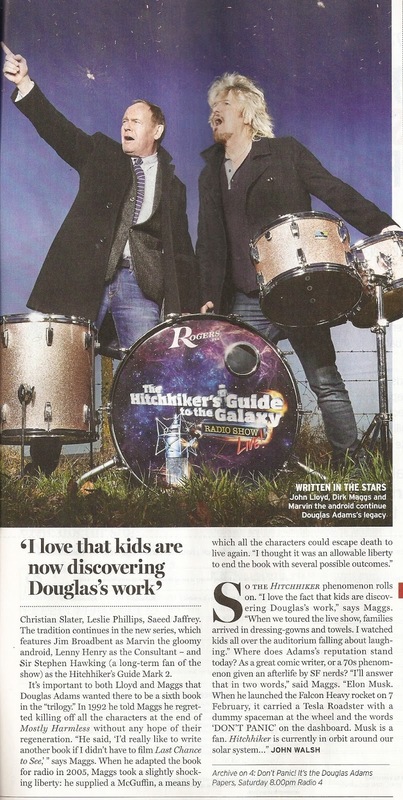 The story (according to The Guardian) follows our heroes, Arthur Dent and Ford Prefect, who visit the tiny planet of Nano, where they find an Irish community run by a chancer called Hillman Hunter. The colony is getting unruly, so Hunter wants a God to supply a few rules. Meanwhile, the Vogons have also discovered the existence of this unlikely Irish colony and are naturally sending a force to eradicate it. There's more about Douglas Adams and how Hitch-Hikers came to be written and recorded in the recent edition of The Archive Hour: Don't Panic! 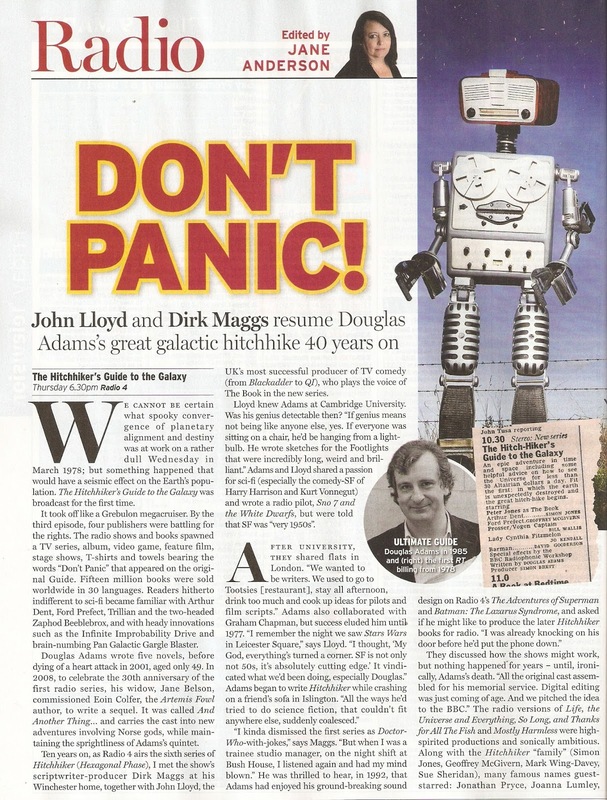 It's The Douglas Adams Papers with his old mate and co-writer (and voice of The Book in the new series) John Lloyd. In this article, from the Observer Magazine of 14 October 1979, Robin Lustig talks to the "young creator" Douglas Adams who confesses his difficulty in writing: as "a desperately difficult process fraught with all kinds of mental blocks and worries."